James Conner looked tremendous running the ball early on and he was the focal point of this drive for Pittsburgh. The drive ended in bizarre fashion as the Steelers elected to punt…with Ben Roethlisberger. Joe Flacco hit Chris Moore for a huge gain and later Alex Collins showed his burst ability with a nice run up the middle on the stout Pittsburgh run defense. Flacco could not get it done in the red-zone and Justin Tucker came in to knock in a 23-yard field goal, Ravens lead 3-0. Big Ben and the Steelers made things look easy against as they worked their way down the field effortlessly. Roethlisberger hit Antonio Brown, JuJu Smith-Schuster, and James Washington for before finally connecting with James Conner for a 7-yard score. Steelers take the lead, 7-0. Ben Roethlisberger found his big target Vance McDonald for a 1st down early and also continued to get rookie James Washington involved. The Steelers stayed aggressive as they went for it on 4th and 1, Big Ben connected with JuJu to keep the drive alive. James Conner looked absolutely fantastic on this drive too, and Big Ben hit AB for a 6-yard score. Steelers lead 14-3. The Steelers got away basically unscathed on their next defensive drive. A huge defensive pass interference call on Terrell Edmunds set the Ravens up in great scoring position downfield. A missed opportunity on a connection between Flacco and Michael Crabtree ended their drive with another Justin Tucker field goal, Ravens down 14-6 at the half. The Steelers picked up right where they left off in the second quarter. Big Ben fired with great accuracy and James Conner ran strong against the Ravens tough defense. Big Ben took it upon himself to sneak this one in and put the Steelers up, 20-6 after Chris Boswell failed to hit the extra point. Flacco looked sharp on the Raven next offensive drive and we got to see Lamar Jackson throw a pass as well. After a couple very costly penalties by Pittsburgh, the Ravens capitalized and chipped away at their deficit. Steelers lead 20-13. Big Ben left the game for a play, Josh Dobbs filled in for that play and connected with JuJu for a 1st down. When Big Ben came back in, his shoulder appeared to fine as he hit Jesse James for a deep pass downfield. The drive would end with a successful 29-yard field goal attempt. Steelers lead by two scores now, 23-13. The Ravens found a bit of a groove on offense as Flacco looked locked in hitting several different receivers. Tucker came in once more for the Ravens, Steelers still lead 23-16. 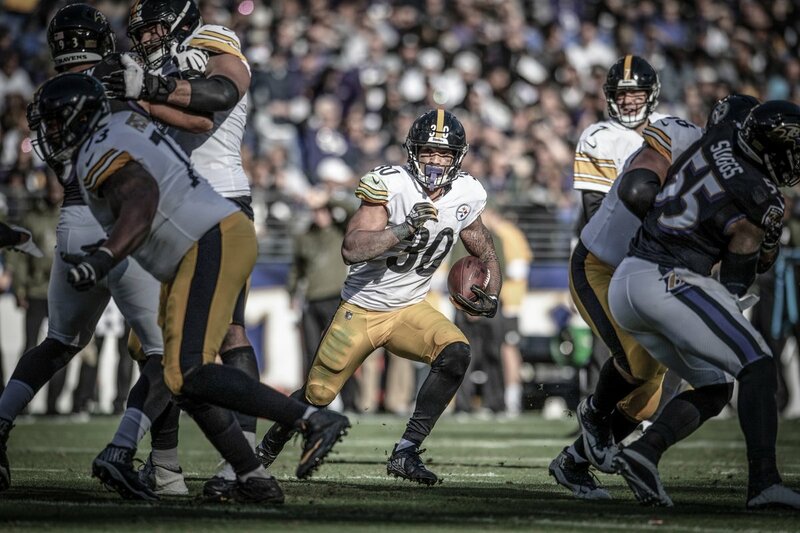 James Conner continued to do damaged against the Ravens top ranked defense and cracked the 100-yard mark for the day. Big Ben hit JuJu right after the two-minute warning to keep the chains moving. Unfortunately, they couldn’t finish things off and were forced to punt. The Steelers held the Ravens off and won their 4th straight game as well as avenged their loss to Baltimore earlier this season. Final score 23-16. ← Previous Story Pregame: Victory in Key Battle for the North? Next Story → Who Runs the North?